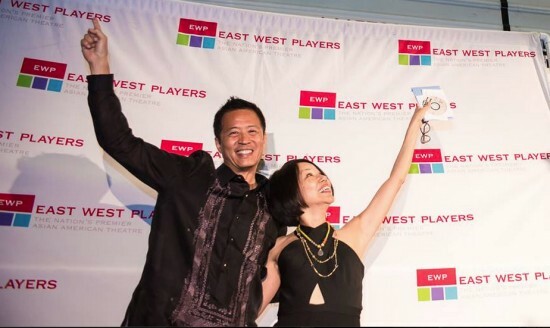 East West Players honored its outgoing producing artistic director, Tim Dang, and outgoing arts education director, Marilyn Tokuda, at its “One Night Only” celebration on Aug. 15. Tim Dang, producing artistic director of East West Players in Los Angeles, is the 2015 recipient of the Zelda Fichandler Award, which recognizes an outstanding director or choreographer who is transforming the regional arts landscape through imaginative, brave work in theater. The $5,000 award, given by Stage Directors and Choreographers Foundation, heralds both accomplishment to date and promise for the future, and lauds deep commitment to a community. Dang has dedicated his career to initiating and innovating diversity and inclusion across the American theater. He has been producing artistic director of EWP, the nation’s premier Asian American theater and the longest running professional theater of color in operation today, since 1993 and affiliated with the organization since 1980 in various capacities from actor to director to producer. Under his leadership, EWP has grown from a 99-seat black box space to a professionally equipped 240-seat mid-sized theater, the David Henry Hwang Theater, located in Little Tokyo. In addition to his outstanding work at EWP, Dang played an instrumental role in creating the Next Big Bang: The Explosion of Asian American Theatre, the first-ever national convening of 200 APA arts leaders, academics and artists. In 2009, Dang was recognized with the James Irvine Foundation Leadership Award, becoming only the second arts leader to receive this prestigious honor. In 2011, EWP along with TeAda Productions hosted the third annual National Asian American Theater Conference and Festival bringing artists from all over the U.S., Canada, India, Australia, China, Singapore, and Great Britain. Dang is on the board of the Theatrical Producers League–Los Angeles (TPL-LA), and the Consortium of Asian American Theaters and Artists (CAATA). He also serves on the Los Angeles Ad Hoc Committee for the Society of Directors and Choreographers. Currently, he has been challenging American theaters (with the 51% Preparedness Plan for the American Theatre) to implement policy within their strategic plan to set goals for more equity, diversity and inclusion in their artistic programming to have more people of color, women and youth under 35 to better prepare theatres for the next generation. Dang has also directed at Singapore Repertory Theatre, PanAsian Repertory Theatre (New York), Asian American Theater Company (San Francisco), Mark Taper Forum New Works Festival, Celebration Theatre, West Coast Ensemble and Perseverance Theatre (Juneau, Alaska). Dang recently rotated off the board of Arts for LA and announced that he would be stepping down as the producing artistic director of EWP in June 2016 in a thoughtful and thought-through transition to make way for the next generation of leadership. He will continue to initiate and innovate diversity and inclusion across the American theater and will play a leading role once more at the fifth National Asian American Theatre Conference and Festival to be held at the Oregon Shakespeare Festival (OSF) in October 2016. A review committee selected Dang from nominees living and working in the Western region of the United States. Selection Committee Chairperson Chris Ashley said, “This year the Fichandler Selection Committee reviewed an incredibly diverse slate of candidates from every state in the Western region, and the breadth and depth of work being done – work that upholds and builds on the legacy of Zelda Fichandler – is astonishing. Directors and choreographers are embedding themselves in their communities in a significant, courageous way. This year’s Fichandler Selection Committee included Donald Byrd, Valerie Curtis-Newton, Mark Hofflund, Jonathan Moscone, Timothy Near, and Damaso Rodriguez. SDCF Chair Sheldon Epps announced that three significant directors have also been acknowledged as finalists: Juliette Carrillo in Los Angeles, Chris Coleman in Portland, and Ruth Pe Palileo in Las Vegas. In establishing this award named after Fichandler, a founder of the American regional theater movement, SDCF recognizes the profound impact of the founders of regional theater and honors their legacy. This award is given annually within rotating regions of the U.S. and serves as a complement to the “Mr. Abbott” Award presented in recognition of lifetime achievement in theater and the Joe A. Callaway Award for excellence in direction and choreography in New York City. The Zelda Fichandler Award will be presented in November in Los Angeles.